As a part of SATRA's centenary year celebrations, we continue our investigation of the association's early days. On October 16th 1929, economist Irving Fisher stated in the New York Times that ‘stock prices have reached what looks like a permanently high plateau’. Unfortunately, this forecast proved to be woefully inaccurate when a sudden economic crash on the city’s stock market only 13 days later cost investors more than $14 billion. This event was a catalyst for what became the global ‘Great Depression’ – sometimes called the ‘Great Slump’. Despite more than ten years having passed since the end of World War I, Britain’s economy had still not recovered from the crippling debt caused by the conflict. Although efforts were made to stave off the effects of this dramatic financial downturn, the crisis began to overwhelm Britain in 1931. Investors across the world started withdrawing their gold from London banks at the rate of £2.5 million per day (equivalent to around £170 million in 2019). Problems caused to the northern industrial areas of Britain were immediate and devastating, as demand for traditional industrial products collapsed. By the end of 1930, unemployment had risen to more than 2.5 million – 20 per cent of the insured workforce, and exports had halved in value. In some towns and cities in the north east, unemployment reached as high as 70 per cent. So-called ‘hunger marches’ were seen during the early part of the decade as unemployed men desperately tried to gain improved governmental assistance to help them cope with their plight. 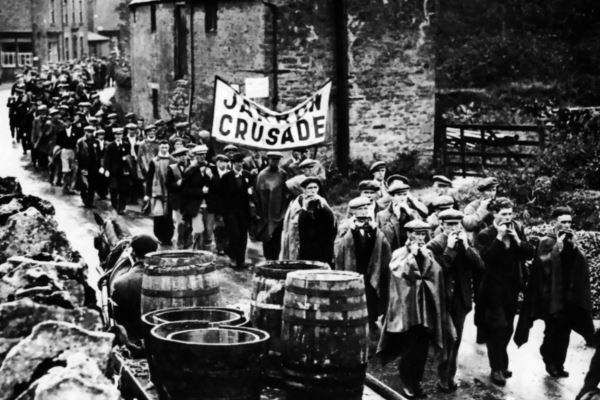 One solution – thought up by the British government’s Ministry of Labour – was the establishment of 12-week courses in voluntary work camps, intended to help young men from areas of the country where unemployment was particularly high. According to the Encyclopaedia of Wales, the government of the day was very concerned about what it described as ‘younger men who, through prolonged unemployment, had become so soft and temporarily demoralised as to require reconditioning by hardening off... in healthy, open countryside surroundings’. The work in the camps was often of a very physical nature, such as cutting down trees, digging ditches and even building roads. These facilities (officially called ‘instructional centres’ after 1931) were mainly run by ex-service personnel, and the regimes they enforced – involving 12-hour shifts, usually for six days a week – have been described as ‘hard and draconian’. The men slept in huts and received part of their unemployment benefit as pay; the remainder of the money being sent to their families. While the government’s aim may have been to dispel ‘softness and demoralisation’, it was estimated that nearly 25 per cent of the 200,000 jobless men who entered these camps walked out before the end of their course and, of those who stayed, fewer than 10 per cent were later able to find work. These camps continued in operation until the outbreak of war in 1939 led to their closure. Although the overall picture for the British economy in the 1930s was bleak, the burden of the depression was unevenly felt around the country. Some regions – and, indeed, some industries – fared better than others. These were the testing times now facing the decade-old British Boot, Shoe and Allied Trades Research Association. During the 1930s, this forerunner of SATRA was primarily concerned with supporting footwear companies in the United Kingdom. It therefore shared many of the difficulties faced by its members. Although in 1930 there was little growth seen in the number of new companies joining the association, some commendable technical achievements were made. For example, a number of foot and last measuring devices were sold, some of which went to Germany, India, New Zealand and the USA, and 250 gallons of the association’s ‘SATRA’ anti-cracking chemical were supplied to customers. In 1931, despite global industry being in a depressed state, SATRA’s financial report was reasonably healthy. Equipment for measuring density, water vapour permeability and air permeability of leather were produced for the first time. In his report for 1932, the association’s director Harry Bradley commended his staff for their hard work during the year. At that time, the organisation’s list of employees was very small, consisting of the director and nine others – Dr Colin-Russ, Dr Edwards, and Messrs Browne, Hammond, Huggett, Mackrill, McKay, Robinson and Sparks. Indicating a level of forward-thinking worthy of a research establishment, Mr Bradley’s 1933 review speculated on the use of plastics within the footwear industry for such items as toe puffs (box toes) and lasts. Two years later, an appeal was made in order to raise £7,000 in order to qualify for a £5,000 block grant from the British government’s Department of Scientific and Industrial Research (DSIR). The member companies obviously appreciated the association’s work, as within a short time no less than £7,137 was raised. By 1935, the body had 337 members – a considerable growth from the 59 members in 1922. 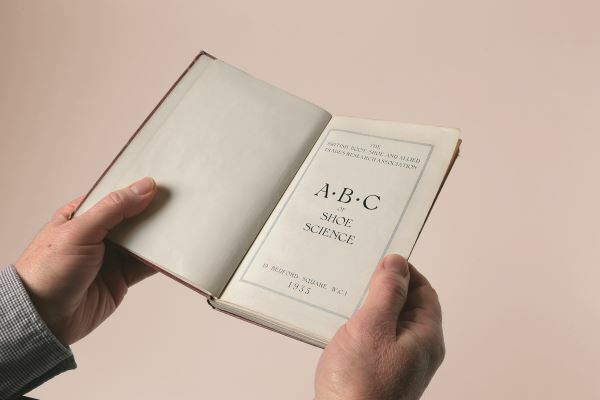 The ABC of Shoe Science book was published and for the first time, as was Bulletin as a monthly magazine. In January 1936, the association reported that important research into walking had commenced which, according to the Monthly Bulletin, involved ‘an intimate study of feet and shoes in action’. Describing the aim of the study, the article went on to confidently anticipate that this ongoing walking research ‘would throw a new light onto all kinds of problems which, hitherto, have been left to pure guesswork or intuition’. It was designed to assess a subject’s walking gait in order to investigate ‘the manner in which, on the one hand, the shoe interferes with the gait and, on the other hand, the distortion which the foot is endeavouring to impose upon the shoe’. Explaining the importance of this new project, the magazine stated that ‘walking research is an extensive field for research which, hitherto, the industry has had to leave largely unexplored. It is only an organisation like the research association which can be expected to make the exploration adequately, for the research requires equipment, methods and personnel usually beyond the capacities of individual firms’. 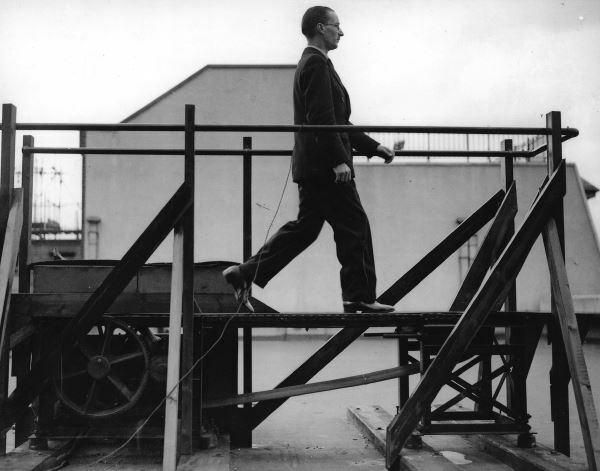 Reporting on the progress in the walking research six months after it had been announced, the July 1936 issue of the Bulletin highlighted that ‘it had always been part of the imagined scheme to conduct walking research to have a moving belt or platform on which it would be possible for an individual to walk without moving away from a particular spot’. In this way, the article continued, ‘a person’s feet could be kept constantly in one line of view of a moving picture camera and so accurate photographic records obtained of the action of the shoes under investigation’. Another convenience of the moving belt arrangement was identified in that electrical connections could be made between the test subject’s feet and research instruments, making it possible to examine such things as the influence of different kinds of shoes and shoe materials on the temperature rise and comfort of the feet. However, as the magazine conceded, ‘a suitable moving belt upon which a person can walk in a normal manner is a fairly costly and also comparatively large piece of equipment.’ For some time, members of staff were puzzled as to how they might proceed with the scheme, as out of necessity the design would have been of such size and weight that it could scarcely be accommodated in the association’s laboratories. ‘After casting about for some time for a way out of the impasse, we were fortunate enough to secure the interest and friendly helpfulness of Dr G P Crowden of the Department of Industrial Physiology of the London School of Hygiene and Tropical Medicine,’ the article added. ‘It was then discovered that a moving belt, something like that which had been envisaged in our scheme, already existed in that department of the School of Hygiene, although it was in a dismantled condition’. The Dean of the London School of Hygiene gave permission to assemble the apparatus on the extensive flat roof of the school, which at the time was in a new building very close to the association’s Bedford Square laboratories. 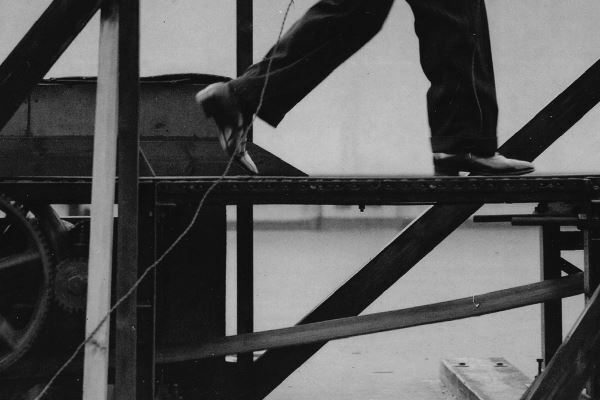 This specific footwear-related research undoubtedly played an important part in contributing to the study of human movement and continues in a refined form today. 1936 was described as ‘a year of anxiety’, when the association failed to qualify for governmental grants due to a drop in members’ voluntary contributions. This led to a report stressing that subscriptions to the British Boot, Shoe and Allied Trades Research Association were not ‘charitable gifts’, but ‘proper business expenditure’. Undoubtedly, the association’s ever-increasing pool of knowledge on the subject of footwear design and manufacture was proving most beneficial to member companies. However, the growing range of equipment available was also appreciated by many users. For example, the association’s ongoing design and production of equipment for the footwear industry was highlighted in a small way within the Bulletin of October 1937. This issue described an instrument – called a ‘shadowgraph’ – that had been designed in the association’s laboratories. According to the report, the shadowgraph (or ‘optical grading apparatus’) was housed in a wooden cabinet approximately 24 x 24 x 30 inches (610 x 610 x 762mm). This cabinet had a transparent glass top and contained mechanisms that permitted the outline of any object placed within it, such as a last, to be shown clearly on a piece of thin white paper placed on the glass. By simple adjustments, the silhouette produced on the paper could be made to be a proportionally graded enlargement or reduction, and differential grading in two directions at right angles could be obtained. The article added that accurate outlines of lasts in plan, profile or at any angle could be secured and the accuracy of grading could be checked. The machine was also said to be useful for grading fancy cut-outs and patterns that would otherwise be difficult to deal with when using an ordinary mechanical pantograph. Indicating the value placed on such equipment, the association received a letter from a member stating that his shadowgraph had proved very useful. He explained that to avoid the risk of accidently breaking the mirror, and possibly depriving the company of the machine’s use for some time, he wanted to enquire about the price of a spare mirror. In 1937, 80 per cent of the association’s members were consulting the organisation on points that were specific to their own concerns and which called for a level of special investigation. These members averaged eight enquiries each during the year. Inevitably, much of this service work involved routine assessments of the quality and suitability of various shoe components, particularly as a result of the abundance of new processes and materials. However, as the Bulletin of June 1938 highlighted, it was the more unusual problem that could produce the greatest benefit to the member. This issue listed a number of difficulties of the day which, it said, could respond to scientific treatment, including i) the position of the toe puff in relation to breakage of cap stitches, ii) correct combinations of cotton and silk upper closing threads, iii) deterioration of rubber soles by a dressing applied to the upper, iv) conveyor systems in the closing room, v) obtaining adhesion of upper fabric to bottom leather in the cemented process, vi) preventing dye from coloured fabric backer soiling the hose, vii) how to remove ink and dye stains from white buck leather, viii) tension tests on shoe seams, ix) preventing gold kid repairer from discolouring, and x) protecting white leathers the factory. During the 1930s, the association strongly advocated the formulation of quality standards for footwear manufacture. To support this stand, a conference was held in February 1938, organised jointly with the Industrial Welfare Society and the National Safety-First Association. This event discussed the desirability and possibility of establishing a performance standard for safety boots. By 1938, the association’s financial situation had improved, and Harry Bradley presented a paper on an innovative research topic entitled ‘Occupational shoes’ at a conference for industrial medical officers. The paper attracted a great deal of attention and it was reported in the December issue of the prestigious British medical journal The Lancet. On September 3rd 1939, two days after Germany’s invasion of Poland, Britain declared war. Under the heading ‘precautionary measures’, the front page of the association’s Bulletin for October 1939 carried the following message: ‘In common with a large number of other concerns situated in Central London, the research association has had to take some measure of precautionary decentralisation. The nature of the premises in Bedford Square made it advisable to have some re-arrangements of the laboratories and in order to facilitate the change around, also with a view to the preservation of records, the offices of the association have been moved to a temporary address: 135 Park Road, Chiswick, London W4’. From this point on, some research projects were curtailed in favour of work assessing military footwear and materials, and the Monthly Bulletin regularly carried articles with such titles as ‘Army boot uppers’, ‘Wartime shortages’ and ‘Footwear and the war effort’. Nevertheless, a number of interesting research reports were still published on the testing of safety boots, lasting and the lastometer, and rubber composition solings. How would the association fare during the coming years of war? The next article in this series will consider the organisation’s activities in the 1940s. This article was originally published on page 40 of the February 2019 issue of SATRA Bulletin.